West Wickham is a town which was formerly part of the county of Kent but now comprises part of the London Borough of Bromley. It has a history which reaches back to the times before the Norman conquest in 1066. West Wickham can be reached by car via the A232. 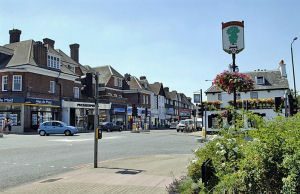 West WIckham is well served by public transport and West Wickham station has routes to London Charing Cross and London Cannon Street. Lanes School of Driving was set up in 1914 to teach locals how to drive. In time Lanes became firmly established as a driving school of excellence with a reputation for quality. At Lanes, the different requirements of each pupil are fully catered for. Lanes offers intensive driving courses to fast track pupils to success. Theory classes are either taken alongside practical lessons or studied separately. After pupils pass their test they can further their skills with a variety of after pass courses. These include: Advanced Driving, Pass Plus, Motorway Driving, and Parking Skills. Pupils often lead busy lives and find it hard to find time for driving lessons. At Lanes we are able to offer pupils the opportunity to book lessons when it suits them best. Lessons can be taken as part of a weekly course or as a single one-off lesson. Lanes is proud to insist on one to one tuition for all our pupils. This ensures that every pupil has the undivided attention of their instructor ensuring that their learning process is fast and efficient. Lanes has a number of contemporary models for pupils to drive. Lanes gives pupils the option to be collected from their doorstep and returned home after their lesson. Lanes have been providing driving lessons in West Wickham, Kent for many years. Please call us today on 020 8166 5678 or click here to send us an email via the contact page. Lanes has a selection of over 40 driving instructors in its premises. Pupils are free to choose the instructor that is best suited to their ability and temperament. Our instructors have experience in teaching all ages of pupils: from 17 to over 70. Our instructors will reassure nervous pupils before they take their first lesson. Every one of our instructors are highly qualified and registered with the DSA as an Approved Driving Instructor. To ensure continuity, every pupil will keep the same instructor the length of the course. Lanes have a team of driving instructors in West Wickham, Kent. Please call us today on 020 8166 5678 or click here to send us an email via the contact page. There are always pupils who are very nervous about stepping into the driver’s seat for the first time. Female drivers can be especially worried about the prospect of being paired with a male instructor. Fortunately Lanes gives all students the option of learning with a female instructor if so desired. The female instructors at Lanes are experienced at making their pupils feel calm and relaxed. Pupils will not be placed under an pressure or subjected to harsh criticism. Lanes have a selection of female driving instructors in West Wickham, Kent. Please call us today on 020 8166 5678 or click here to send us an email via the contact page. Many pupils ask to learn on automatic cars. It is true that manual cars allow the driver greater control. Nevertheless, automatic cars are less daunting to the average learner. They are undoubtedly less complicated; furthermore, they do not stall. Pupils will frequently progress faster in an automatic vehicle. Lanes have a selection of automatic driving instructors in West Wickham, Kent. Please call us today on 020 8166 5678 or click here to send us an email via the contact page.